When Alfred H. Maurer (1868–1932) became one of the very first Americans to dedicate himself fully to the principles of Fauvism, he distinguished himself from his American contemporaries. His understanding of Fauvism was nuanced; his commitment to this aesthetic was sustained. By early 1907—already strongly linked to Leo and Gertrude Stein and entrenched in the vanguard spirit of the times—Maurer demonstrated a sophisticated understanding of Fauvism, one that went beyond simply painting with bright pigments. In his quest to explore new pictorial realms, he formulated a body of modernist work that balanced subjectivity, intuition and expression. He bridged the gap between nature and artifice, and offered a synthesis between real and imagined space. Alfred Maurer lived and worked in France between 1898 and 1914; he came to maturity as a modernist during Fauvism’s heyday (roughly between 1904–08). During this incredibly spirited artistic era, he tested the elasticity of what it meant to be modern. Maurer turned to the time-honored subjects of still life, landscape, and figuration and infused them with vanguard ingenuity. Never timid, he painted with remarkable confidence, demonstrating a new respect for the dictates of form and color, always envisioning novel ways for the two to work in tandem. Playful, witty and sometimes acerbic, Maurer delighted in celebrating visual dichotomies. Painting in luminous, sensual colors arranged in unexpected juxtapositions, he re-defined and reordered reality. Like many of his forward thinking peers, he did so through the lens of Henri Bergson’s theories on time and space—presenting the world in a state of flux—showing it as an endless flow of time. Maurer wove these complex ideas into alluring compositions where all meaning is temporal, and nothing was fixed or certain. 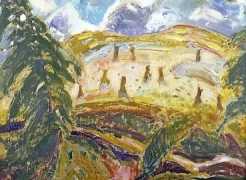 While Maurer’s commitment to Fauvism informed later phases of his career, the purest examples of this aesthetic are to be found in the artist’s work from roughly 1907 to 1914. Most of the paintings produced during this time remain unlocated—having been abandoned by the artist in France when wartime hostilities prompted his sudden return to the States. The known handful of Fauve works thus stand as rare examples of Maurer’s early contribution to the development of American modernism. Those on view in “Albert H. Maurer: Fauve in Focus” offer collectors and scholars a unique opportunity to examine key works from this extraordinary chapter in Maurer’s career.